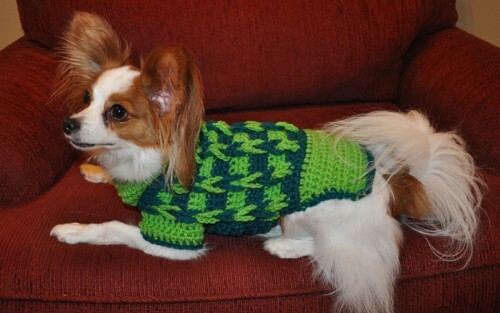 The Decorative Loop Crochet Small Dog Sweater is cute for both boy and girl dogs. 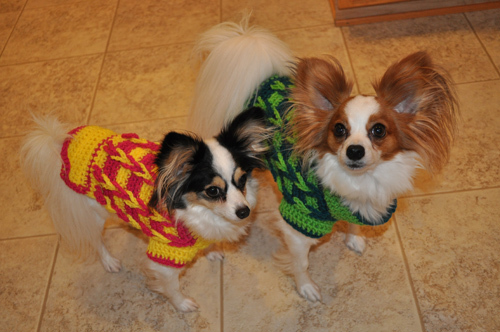 This is a photo of my two papillons, Lily and Jasper wearing their coordinating sweaters. They get many compliments when out for their morning walks! The sweater is worked mainly in single crochet, chain stitch and half double crochet. It has a great texture and interesting pattern created by the interlocking chain loops. Here you can see the collar detail. The collar is simple to make longer or shorter if you wish. Here is the sleeve detail which can be also easily be lengthened or shortened depending on your preference. The Decorative Loop Small Dog Sweater Crochet Pattern is available for $5.50 in my Etsy shop. Stop by today to see all the latest crochet and sewing patterns at Stitchwerx Designs on Etsy! 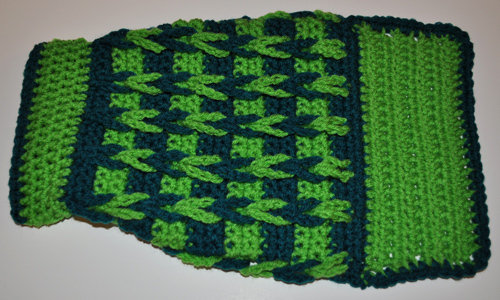 This entry was posted in Crochet, Dog Clothes Patterns and tagged crochet, crochet dog sweater, crochet dog sweater pattern, crochet pattern, small dog clothes, small dog sweater. Bookmark the permalink.